So the fever, frenzy, obsession, excitement continues! While being hard at work a couple of weeks ago I "stumbled" upon a fan made poster of New Moon. As protocol requires I immediately had to compare this poster with the official New Moon poster. I think that they are both fantastic and thought I should share them with all those Twilighters out there. 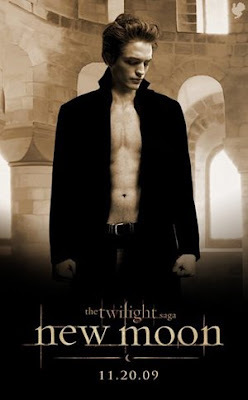 I am just not so sure about this bottom poster of Edward....the movie does look pretty good though!